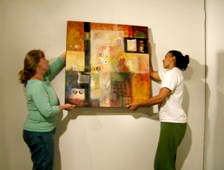 The Dorothy Herger Gallery is dedicated to the enrichment of the visual arts on the Solano College campus. 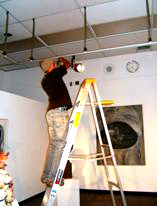 The Gallery presents emerging and established artists from the local and regional communities. The Gallery supports art history and studio art curricula by providing venues for object-centered learning, as well as presenting socially relevant themes pertinent to general curricula. Artist talks offer forums where students, faculty, staff and administration can develop a greater appreciation of the creative process. Exhibitions are chosen, installed, and managed primarily by students currently enrolled in Art 60: Exhibition Design, thereby giving them hands-on experience in gallery operation. In addition to the Herger Gallery, Solano College offers exhibition opportunities at the Vallejo Center, the Vacaville Center, and the library on the Fairfield campus. Monday – Friday, 10:00 am to 4:00 pm; Saturday by appt. Monday – Thursday from 8:00 am to 8:00 pm; Friday from 8:00 am to 4:00 pm; Saturday from 8:30 am to 1:30 pm. 100 building, group study section in the library. Monday – Thursday from 7:45 am to 7:50 pm; Friday from 7:45 am to 2:50 pm. (707) 864-7132 for circulation desk. Questions should be directed to Janene Whitesell, instructor/exhibition coordinator at janene.whitesell@solano.edu or at (707) 864-7000 ext. 4398.